If we want spiritually productive schedules then we must live according to the strength Christ provides which we find through His Word, by grabbing hold of His grace, as we walk in His light and devote ourselves to doing what is good. It’s about far more than checking things off our “To Do” list. Spiritually productive schedules move leaders beyond mere activity and accomplishment to bearing spiritual fruit. 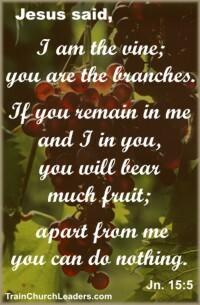 In John 15 Jesus makes it clear that we must abide in Him to bear fruit. Apart from Him, we can do nothing of eternal value. Consequently, that which keeps us from abiding in Him, is going to hinder spiritual productivity. If our schedules don’t lead to the bearing of spiritual fruit, then they are unproductive. We find the word “unproductive” or “unfruitful” in a few verses that cue us in to what could cause such a spiritually barren existence. 1) Putting too much emphasis on the temporal concerns of life (i.e., money) can keep us from focusing on eternal truth, leading to spiritually unproductive schedules. Without the truths of God’s Word at work in our lives, we cannot be set free to be all we should be (Jn. 8:32). 2) Failing to remember and rely on all God has done for us through the cross keeps us from developing the qualities we need to be productive and effective. Without God’s grace we are nothing and can do nothing of eternal value (1 Cor. 15:10). 3) Living with sin in our lives rather than dealing with it, keeps us from being fruitful. Spiritually productive schedules are born out of Light, not darkness. Without walking in the Light we cannot produce fruit in keeping with who God is and His eternal purposes. 4) Being inactive leads to unproductive lives. Without a commitment to purposefully pursuing spiritually productive schedules, it won’t happen. This entry was posted in Time Management .